ADDIMaschenfix - or Stitch stay - is a heart shaped accessory to clip onto a circular needle cord to prevent stitches moving or slipping along, a practical idea for knitters using circular knitting needles. When clicked onto the addi cord, the ADDI Stitch fix holder prevents the knitting from sliding down the cord. You no longer have to bother with pushing it back up all the time - just keep on knitting. The set includes two pieces each of three sizes, which fit the original addi cords. 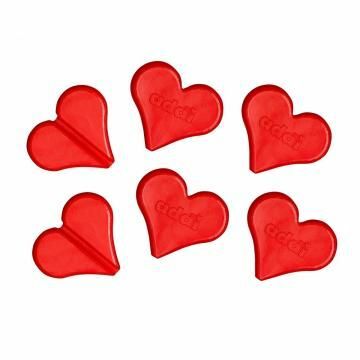 Each package contains 6 hearts: 2 each of 3 sizes to fit different cords. Manufactured for ADDI near their company headquarters - in Germany, naturally.